Where did the Gaspee raiders from Providence live and work? 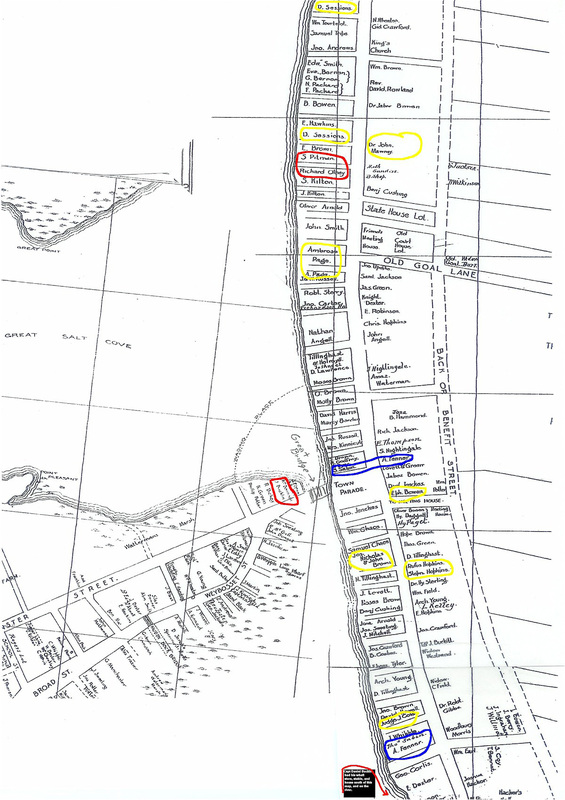 This map identifies properties in Providence of the men ho participated in the Gaspee affair. Click on the thumbnail to enlarge the map for your viewing. This map is based on two primary sources. The tax assessors records for the 1770 taxation of property. The assessors walked the streets and so the location of the buildings taxed can be ascertained from their notes and the order of the notes, and the wonderful catalog of Kinsley Carpenter, who in 1771, decided to inventory each building in the town proper of Providence. On this map there are two areas circled in blue. They are the two areas where there are both places that have been identified by one writer or another as the Sabin tavern of the Gaspee gathering fame, said to be adjacent to the businesses and wharf of Arthur Fenner. Both of the two circled areas have items that make them likely candidates. The more northerly location, on the Market (aka Parade) was the main business area of Fenner. It had most of his warehouses and leased properties for stores of various sorts. It was in the center of social and business activities of the town and a good place for a tavern. The Market divided the residential population of the town into almost three equal pieces: north, south, and west of the Great Bridge. Trouble is, for those trying to locate the tavern by documents, the Sabins had another tavern, further south, rather out of the commercial and business activities of town, but also adjacent to a Fenner property and wharf. What it lacked in town center attractions, it probably made up for as being a place at which larger ships could be more easily landed. On this map there are areas circled in red. They are Bucklin properties. The main Joseph Bucklin 4th property — at which he had a wharf, store, block makers shop (blocks are things used in hoisting sales) and a good house — is on the west side of the Great Bridge. The red circled area there also includes the house owned by the partnership of Bucklin and Donnison. Until after the Revolutionary War, the Weybosset Street Bridge was a drawbridge, allowing ships to move north of the bridge to the area known as the Great Salt Cove. Until the bridge was converted to a fixed bridge, the head of the harbor was on the North end of the Great Salt Cove. “Store” is the term applied to the sort of building that merchant shipowners had. At the conclusion of a voyage, the merchandise obtained on the trip was put into a building (the store) and then sold from there. There still exists a 1784 store building of Christopher Sheldon, which gives us an idea of what sort of building the merchant ship owners of Providence had. Bucklin’s store may have looked something like that of Sheldon. Follow this link to the Historic American Building Survey/Historic American Engineering Record at the Library of Congress. http://memory.loc.gov/ammem/mdbquery.html Click on the link and in the resulting Search block, enter “Christopher Sheldon” (not case sensitive) and proceed from there by clicking on the “2 b&w photos” icon for the photos and the “5 data pages” icon for a good description (use the “NEXT DATA PAGE” link resulting from the “5 data pages” and/or for a (very) brief summary, click on the “Supplemental Material” link. The partnership of Bucklin and Donnison also owned another wharf and some sort of building on the river at the far south end of town, out of the area shown on this map. A second red circled area relates a two-storied house of wood, two doors above the Court House, owned in 1759 by Jonathan Bucklin and then operated as a tavern. Before 1770, Jonathan sold it to Richard Olney, who also operated a tavern there. Richard Olney operated the inn under a sign of the “Crown,”. The Town Council occasionally met there. 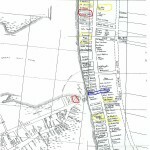 At the bottom of the map, there is a red circled area about a note indicating that a little south of the area covered by the map, on the river, was the wharf, shop, barn, and house of Capt. Daniel Bucklin, who made a good living during the Revolution, with his own ship, as a privateer. On this map there are areas circled in yellow. They are locations where persons involved in the Gaspee affair lived or worked. List of the persons having property in 1770 in the compact part of Providence. Chace map of the area west of the Great Bridge, as it was in 1770. The Chace map of the highways of the Providence city area in 1770 shows bridges at Central Street and at India Point. We have great faith in the scholarship of Chace and his research. You might be aware that the 1777 military map of Blaskowitz does not show those two bridge that Chace shows. We have done independent research (at the request of the government researcher tasked with identifying the route used by the French in leaving Newport and going to the battle at Yorktown). Chace is right. The records of the colony show the existence of those two bridges by 1770. 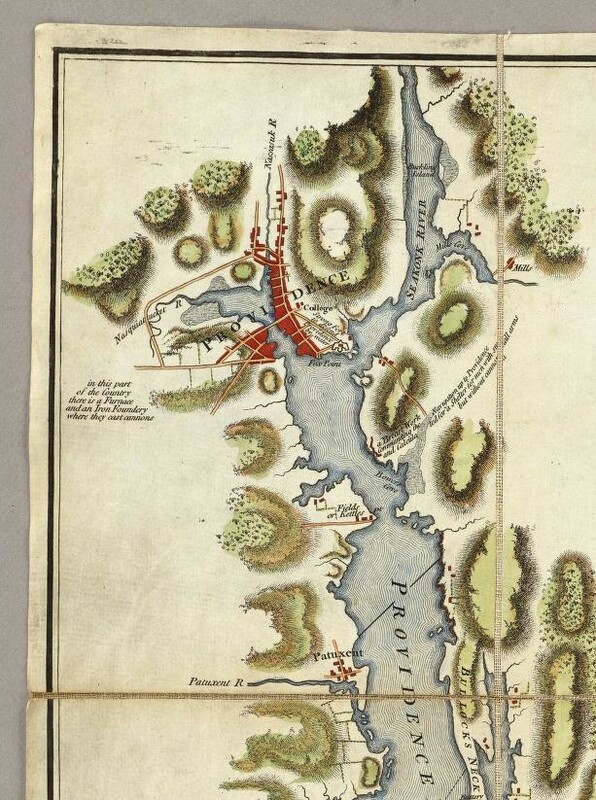 Blaskowitz was remiss in not showing on his map for English military movements those bridges, which were not only to ship movement of troops but also an aid to troop movements over the Seekonk River.